I haven't seen Pike's since 2006, but I remember just about every step i made on that mountain. Such a fantastic run. Local Natives are going to blow yr mind! Dancing is key. I am jealous and agree that there is something magical about Pikes Peak that draws many of us to it. Wish I could get there more often. You mentioned grad school... What are you studying? what is your bachelors in? "And no trip to the summit would be complete without one of our world famous donuts, made fresh at 14,000 feet!" Tony, maybe it's the food that draws you to Pikes? Can you smell it on the way up the trail? Never been, but I take it's not a wilderness experience? No, Pikes, for the most part, is certainly not a wilderness experience. There is definitely something a bit surreal about having toiled through the roadless woods and airless tundra for a couple of hours on a singletrack trail only to pop onto the summit and often be greeted by hordes of tourists, a gift shop, and a cog train. But, for some reason, it doesn't really bother me. Sure, it might seem like willful denial, but even those things aren't enough to cancel out the mountain's sheer scale and undeniable natural beauty. Part of Pikes' uniqueness is its accessibility. 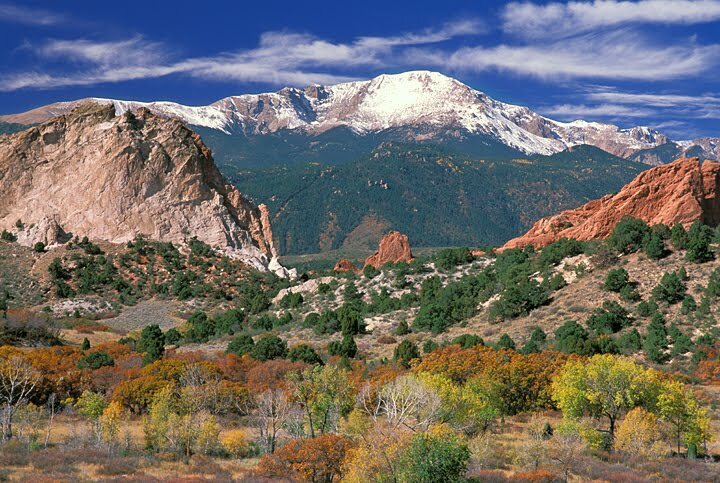 If any mountain is capable of having charisma, it's Pikes Peak. please, keep your life style on! enjoyed your "off" training time! Well, that thought-consideration brings a smile to my face. But then your casual run up and down would have just edged me so I end up considering that I need to up my game. when you say up back down front of Green what do you consider the "back" trails and what are the "front"? just trying to gauge how far I go when I do it on occasion. New Question- Where would be your optimal place of living outside of Colorado??? Recycled Questions- What has K. Skaggs been up to?? Still the organic agriculture stuff you mentioned a while back?? Will you guys ever train together again?? Which city inside Colorado do feel has the best overall trail running, within a 25mi radius?? This is off topic, but I know of nowhere else to post this inquiry. I live in central Alaska. I wear New Balance 790's. But I have yet to find a minimalist shoe for winter running, something with a bit more lining. It can be fifty to sixty below up here, and I am tired of reverting back to the normal, pillowy running shoes after loving the low-profile summer sneaks for three months. Anton, would you be willing to bug somebody at New Balance about this? Can you even do that? Or does any other runner have a clue as to how I might build a pair of my own? Where could I get the material? Find someone to sew them up? Not gonna lie Anton, Local Natives put on the best show I have ever seen in my life. It almost brought me to tears! Enjoy!!! Im very jealous!! hey brian, saw an awesome video of you on http://barefootrunningshoes.org which has some pretty cool shoes I'd like to try. do you happen to practice in any of those other shoes besides the new balance and also, did you produce that video yourself? It would be interesting to see what someone of your ability could do on this trail. Thanks for continuing to update us on your weekly training and pics. Looks like field for TNF50M(SanFran) is starting to take shape. Krupicka, Dakota Jones, Eric Grossman, Chris Lundstrom, Gary Robbins, Erik Skaggs, Nathan Yanko and a few more. One name that stands out from way across the pond is Jonathan Wyatt. As you know, he is probably the top mountain runner at the shorter distances. Wonder if this is his first crack at 50 Miles? Too lazy to look up info on NB website; what do you think of the minimus line for running country roads in eastern NE? More gravel than the loess bluffs of Niobrara. I vary my shoes; xcountry flats, road flats, minimal trainers (Brooks Ghost, e.g. ), but I'm intrigued by NB's investment in minimalist shoes. Keep on it! missed the local natives in los angeles this last week, but the walkmen were on point. as good as ever. if you get a chance, see them. I'm so jealous you got to see Local Natives!